Social media is great for staying for in touch with existing customers, building loyalty and can even win new customers. Let’s say you run a Facebook Page for your Business and you keep it up to date with regular, quality content. Let’s also assume that you have “Like us on Facebook” links on your website and various calls to action on your marketing literature, prompting people to become a fan of your Facebook page… but what happens in store, if your’e you’re out an about at events & trade shows, conferences or even giving a talk? It’s in store or at events that you’re most likely to engage & impress new customers so that’s the best time to get them to follow your social output. The moment they walk out of the room you have probably lost them unless you can get them to do it there and then… by text message. Most Facebook accounts are linked to phones which means you can also get “likes” via text message. Adding a sign in your store, stand or a slide in your presentation like the one below (template linked below) will help to capture the moment. 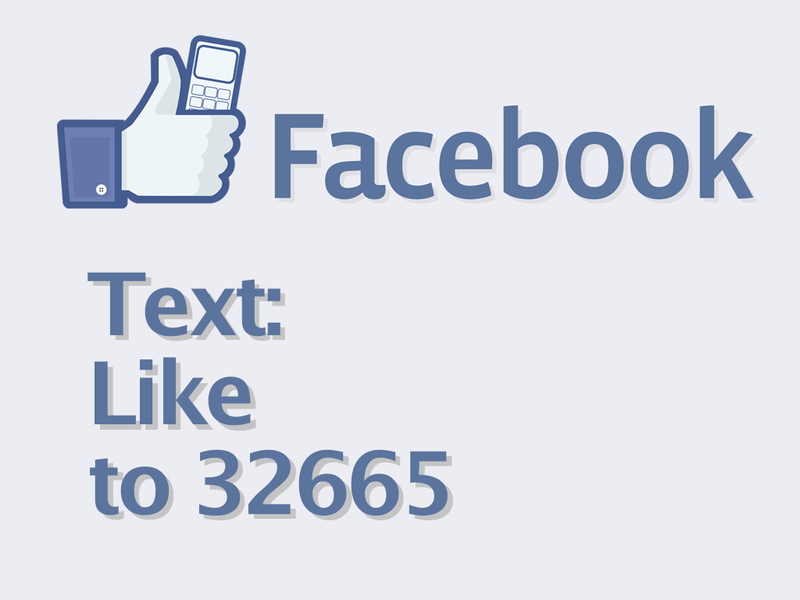 All you need to do is ask the audience to text the word “like” and the name of your Facebook Page to 32665 (FBOOK). You might want to add a slide to your talk, put it on your promotional literature, have a poster on your trade stand or add it to your email signature. If you use QR codes, you can create one that triggers the SMS in the phone so all the person has to do is scan it and press send but remember to offer that as an alternative as it’s now recognised that very few people bother with QR codes.